Tucson Happenings would like to thank Funny Foot Farm for their support! Funny Foot Farm is not your typical petting zoo, we provide a Unique Education Experience for everyone! Do you love animals? Would you like to have an up-close encounter with animals from around the world? Come take a tour and learn about our amazing Animal Ambassadors! Here at Funny Foot Farm we provide an educational environment to learn about and interact with animals you don't see everyday. We have many domestic breeds; goats, sheep, mini cow, chickens, ducks, turkeys, rabbits, and mini pigs, along with exotic animals from far reaching sides of the globe. Our largest Exotic Animal and the heart of the farm are our capybaras. Capybaras are the worlds largest rodent and native to South America. Funny Foot Farm is the only facility in the US where you can interact with 6, belly scratch loving, kale munching, capybaras! You can also meet African Crested Porcupines, Patagonian Maras, Red Rumped Agouti, Sulcata Tortoises, Emu, and many more. 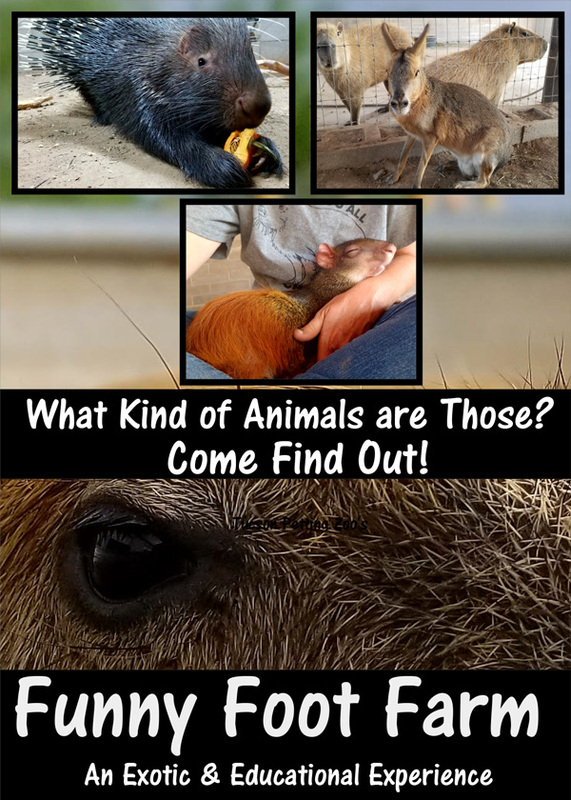 A trip to Funny Foot Farm includes a docent guided tour of all our exotic animals and a self guided tour of our domestic animals, with opportunities to feed and/or interact with most. We strive to provide a learning environment for all our guest and can accommodate any age group or special event. Bring your family, your class, play group, or birthday party, we have activities designed for everyone, discounts for school and large groups are available.